The reason we mention this quote today is that we couldn’t disagree with it more! 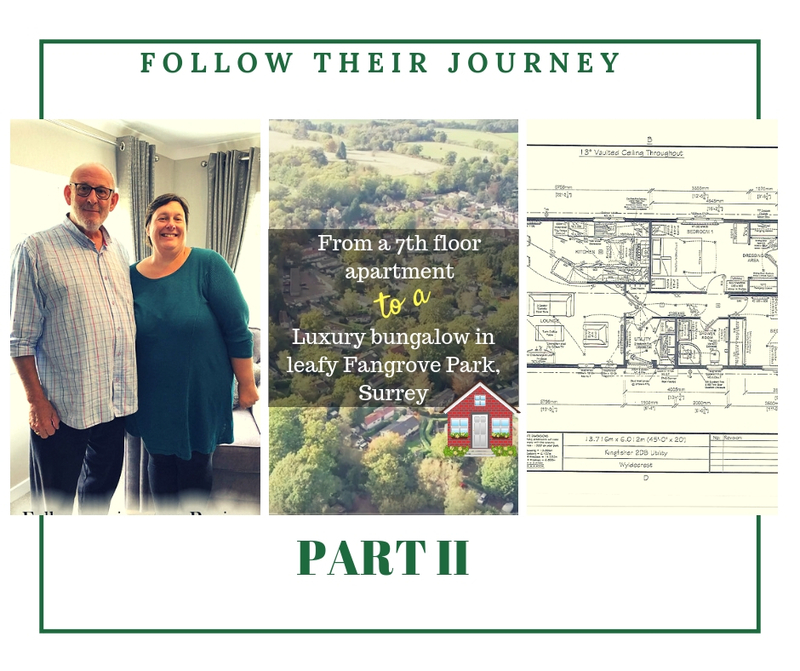 Did you read about Julie and Alan’s initial journey in which they started their journey of looking for various options for moving into a residential Park home? They pictured living in a traditional English community in a beautiful green setting and set their hearts to make their dream a reality. A luxury bungalow in leafy Fangrove Park, Surrey ticked all their boxes and they put in a deposit to reserve their chosen plot location and home. Well, this time we met up with them to discuss and decide all that would be a part of their new home when they move in. From the color of the rug to the texture of the blinds, we discussed everything. It took us about 4 cups of coffee and 4.5 hours of choosing, rejecting and deciding and then reconsidering! However, we got there in the end and that’s what is important. So we laid the floor plan on our huge table and we started looking at the heart of the house—any guesses? You’re right – The Kitchen. Julie and Alan have chosen a home known as the Omar Anniversary– which is essentially a very luxurious bungalow with a modern layout, with French doors and glass front fascia. The kitchen is open-plan and has literally un-ending workspace and is extremely airy. It is also a modular kitchen with fully integrated appliances. Julie wanted to move the boiler out of the kitchen into the utility room and have the fridge freezer as a tall unit with a 50-50 split. Well, it was a very wise decision to have it as a tall unit rather than having an under-counter fridge as you wouldn’t want to kneel down to access the fridge all the time! They then chose lovely off-white tiles with a grey color tile thrown in a 5:1 ratio. They chose a very modern worktop with grey/off- white motley of colors. And they chose very English traditional off-white color doors for all their kitchen cabinets. They were happy with their oven grill and the flooring in the kitchen so we moved on to the lounge area. For the lounge area, they chose to let go of the fireplace as they wanted their TV with a lovely console table there. They were very conscious of the fact that since one wall of the lounge was all glass, they would get a lot of sun, hence didn’t want all the reflection coming on to their TV screen and making it impossible to watch the telly. They were happy with the 2-seater sofa and the 2 one-seater sofas. They have their own small side-tables which they intend to bring with them. Now a very important question – the color of the sofa? That was linked to the color of the carpet. That, in turn, was linked to the color of the curtains. Makes total sense, right?! So we tried various combinations and then some more. But again-worth it! We decided on a very nice combination of a grey carpet, cream-colored curtains and a very nice charcoal/grey sofa. They also chose a matching Oak coffee table, Oak mirror, and a matching entertainment unit. The second bedroom was easy. They did not want a second bedroom- rather they planned to use it as a study. So they canceled the beds and finalized it as an empty room – they wanted to add a desk and shelves but decided to do all that after they move in and then decide what would be best suited. The only discussion was regarding the blinds they wanted in that room- and they chose a lovely burgundy color for that. They replaced the 2-drawer wardrobe unit with a 4- drawer unit so that they could have their second telly there. They were happy with the in-built wardrobes. For the en-suite bathroom, they chose Grey wall tiles and a white bath and panel. An Illuminated mirror and a chrome heated rail with a wall-hung basin unit are what they selected. After hours of deliberation and thought, with a lot of creative ideas and changing of mind, the transformation of a piece of land to a beautiful dream-house was now good to go. So unlike Mr. Ford’s penchant for the color black, this house will be full of vibrant colors that suit the bright personalities of Julie and Alan. They had a full palette of colors to work with and are extremely happy with the final choices they have made. The color scheme has looked lovely during the discussion and we are as impatient as them to see the actual home! So the home has all been documented and filed and work is in full swing. Their plot is being developed as I write this and we are hoping that they will move into their luxury park bungalow around Easter! We promise to share the final phase of their journey when they move into their actual home! This retirement residential park is located off Lyne Lane, in the semi-rural village of Lyne, and the larger centers of both Chertsey and Virginia Water are just less than 3 miles away – where you will find a wide range of retail and service outlets, together with leisure and many other facilities, as well as railways stations with regular trains into London Waterloo and also towards Reading and Wokingham. Why not see for yourself, please get in touch with us and book a visit to Fangrove Park today?